With CaseWare Cloud, you’ll get a client portal, a document manager, a complete time and billing system plus innovative analysis tools all out of the box. Never has collaborating with clients been easier or more efficient. With CaseWare Cloud, you can effortlessly share, manage, request and store files from your clients. 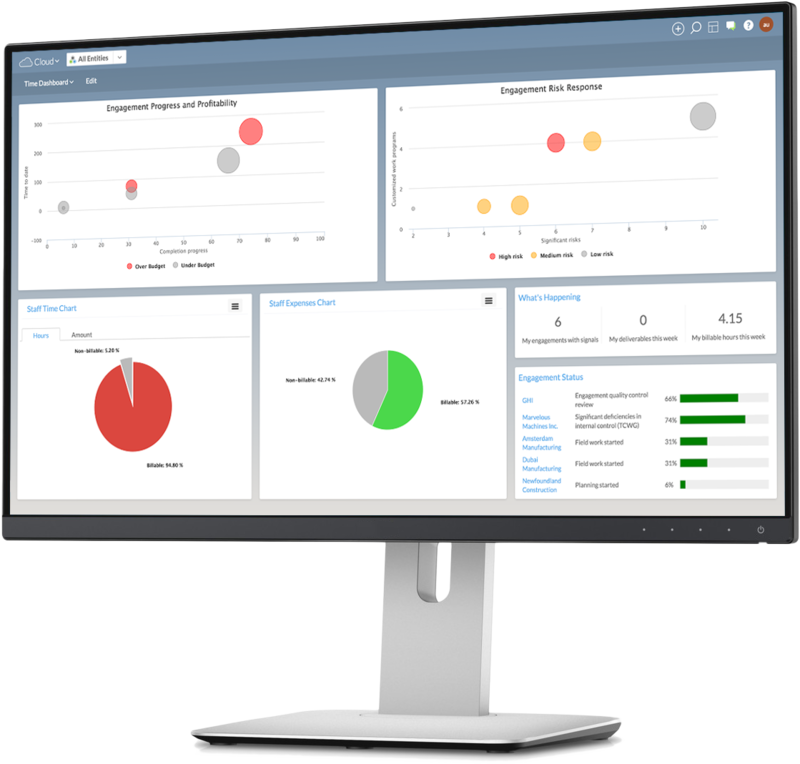 Custom dashboards provide key firm metrics, insight into firm performance and centralized reporting. With CaseWare Cloud’s built-in monitoring tools, you can analyze and improve the performance and efficiency of your staff and practice. What’s more, you can monitor the status, quality and efficiency of all your Working Papers engagements across the entire firm, from any location. With all engagement data in one centralized source, staff can now seamlessly manage their workspaces, tasks, workflow, and discuss ideas inside and outside of the office. And CaseWare Cloud comes with full retention and data disaster recovery for all your documents. By combining easy time entry, seamless invoicing and automatic expense tracking, CaseWare Cloud offers everything you need for efficient time and billing. What’s more, everything can be done while on the go and billable hours can be captured as you work.